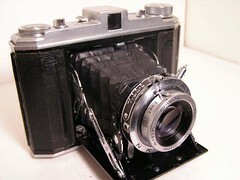 Baron Camera K.K. (バロンカメラ㈱) was a Japanese company, which made the Baron folders from mid-1952 to early 1956. It seems that the company was founded as Chūō Seiki K.K. (中央精機㈱) and adopted the name of its products somewhere between 1953 and 1954. All trace of the company is lost after January 1956. ↑ Dates: advertisements and articles listed in Kokusan kamera no rekishi, p. 359. An advertisement dated January 1956 (reproduced in Kokusan kamera no rekishi, p. 162) says that the company was making folding cameras for four years. ↑ Compare the two advertisements reproduced in Kokusan kamera no rekishi, p. 161, dated September 1953 (with a CHUO BARON logo) and September 1954 (where the company name is バロンカメラ株式会社).